Welcome to IslamJesus.ws Jesus, or more appropriately Eesaa (عيسى, also Yesua, Esau), the son of Mary, peace be upon him, was no more than a Prophet in a long line of prophets who called to pure monotheism [singling out Allaah (al-ilaah, elohim) in worship and shunning worship of everything and anything besides Him] and Eesaa was sent to the Banee Israa'eel (Children of Israel) to abide by the Torah. Muslims believe that Eesaa came to be through the word of Allaah, that he was of miraculous birth, that he was raised up unto Allaah and will return in the end times to proclaim the message of Islam as left by the final Messenger, Muhammad (prayers and peace be upon him). Muslims are the true followers of Jesus today. They abide by his monotheistic teachings, they worship like Eesaa (and the Prophets of Banee Isra'eel) and they resemble Eesaa in their appearance and dress. 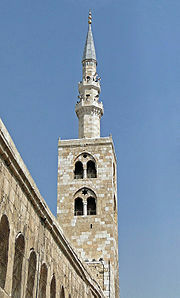 To the right is the minaret of the Umayyad Mosque in Damascus, Syria, in whose proximity Eesaa will descend near to the approach of the final Hour.